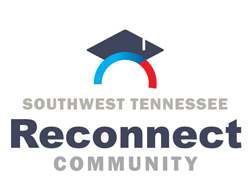 Serving an thirteen county region surrounding Jackson, the Southwest Tennessee Reconnect joined the Network in 2015. This work, for me, is personal. It’s the cumulating of many years of personal struggles to arrive where I am today. I know that without having returned to college to complete my bachelor’s and master’s degree, I couldn’t feel what another student sitting across from me feels. Someone helped me, I’m duty bound to pay it forward. Being a native of West Tennessee, I’ve seen firsthand the economic struggles of citizens living in our region. I want for them the same things I want for myself and my family. A job that pays a living wage, opportunities for my children and family to live a comfortable life, and a door of opportunity for us all to walk through to make those dreams a reality. We’ve had many champions during our six years in providing college access services throughout the Southwest Tennessee region. Elected officials, public and private sector entities, and higher education institutions alike. But I’d have to say our “first” and greatest champion was our Executive Director, Joe Barker. Joe not only brought his vision of increasing educational attainment levels to the most rural parts of West Tennessee to reality, he became the example we all look to when he decided to go back and “reconnect” with his former institution to complete his degree after 46 years of service to the region and the State of Tennessee! Leading by example always gets me!! Our goal is twofold. First, we will consistently strive to meet people “where they are” and provide the same level of service for everyone who walks through our door, regardless of their circumstances. Second, we want to lay everything we’ve got on the line to help people achieve a better life for themselves, their family, our community, and our state. We will bring all of our knowledge, resources, and heart for all our neighbors. This is our calling; this is our passion. We’re aiming to become the most well informed, well-equipped, well connected one stop shop for adults to reconnect in the southeast! We are bringing to bear all of our talents and resources to keep this grassroots movement alive. Rural West Tennessee understands the value of regionalism and has pledged huge amounts of human and financial capital to make it the best place it can be. Nothing epitomizes the credo of our state like the West Tennessee region. We’re “Volunteers”! We want to see everyone win, no matter what and we’re willing to do all we can to make that happen!